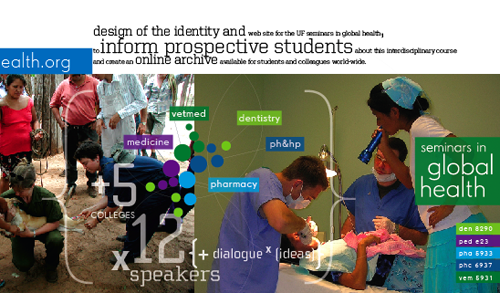 The design of the identity and web site for the UF seminars in global health, to inform prospective students about this interdisciplinary course and create an online archive available for students and colleagues world-wide. Maria Rogal and Ligia Carvallo worked on conceptualizing the identity in collaboration with client-side coordinator, Jorge Hernandez. The web site was developed in Joomla to enable our global health colleagues to update the site as needed. The symbolic marks for UF Global Health are based on a single, basic element: the circle. Their groupings suggests both the individual and the collective and are simultaneously static and active – forming a range of reflexive configurations that infer the multiple, diverse interactions, interdependencies, and commonalities between individuals, collectives, and disciplines in their various contexts. Relationships between parts are significant and convey meaning: the central, negative spaces signify opportunities for exchange and interaction. The seminars are not ONE fixed space for interaction but many and diverse, thus underpinning the rationale for the design as open, infinitely flexible, and scalable based on interactions and communication objectives. Influenced by both the seminars identity and professional organization websites, these colors – one assigned to each college – together form an analagous palette (next to each other on the color spectrum). As energetic, friendly, and vibrant colors, they support the seminars’ identity and are applied in the symbolic marks to show difference and interactions. The geometric, ample, and generous forms of this typeface, Drescher Grotesk, support the identity of the seminars: evoking transparency, simplicity, openness, generosity, and directness. The figure to ground relationships formed by the strokes of the letterforms (noted in the contrast between linear and geometric forms and the rhythm between letters) create subtle, exquisite interactions and visual pathways that reinforce the literal and conceptual movement and growth as a seminars objective. This wordmark may be configured two ways depending on space available and used with the symbolic marks or on its own. Jorge Hernández’s commitment to the seminars and international programs sold me on this project. It was an opportunity to create smart design and engage others in the power and potential of design. While the conversation on promoting the Seminars in Global Health began with using the print medium for information dissemination, it quickly shifted to developing an online presence given the coordinators’ interest in information sharing, knowledge transfer, and in reaching the broadest possible audience. A web site for UF Global Health would prove the most effective way to announce the seminars, share their rich content, and provide permanent, online access to materials – for the UF community and beyond – this year and in the future. When I began this project I knew little to nothing about the HSC colleges, programs, or structure. The value of this position was my empathy to the information needs of an equally uninformed student audience. Why would I, as a student, want to enroll in this seminar (ie, what’s in it for me)? What will I leave this course with? How will I be smarter, better prepared, and enriched by this course? What is so important about global health? Our goal was not to make something pretty, but to create a product that would be functional, informative, and compelling to generate interest in global health. We engaged in a discovery process prior to the design phase and researched other global health programs. Using the guiding concepts of the seminars, I worked with designer Ligia Carvallo to develop an identity system that could serve as the conceptual foundation for years to come. The solutions are a result of our interest in smart, process-oriented design which also compliments the seminars’ vision. Working closely with Jorge Hernández, we arrived at the decision to implement multiple marks instead of selecting only one. As Jorge observed, multiplicity signifies the dynamic change and interactions of participants, communities, and collaborations. This is an example of how we respected our own very different disciplinary frameworks of understanding and also listened, asked questions in multiple ways, and had an open mind as we worked together. The more dialogue we had, the more we were able to clarify and reveal the goals, concerns, and hopes for the seminars and this, in turn, surfaced the creativity, intelligence, and perspective that everyone brought to the table. Because one concern we repeatedly encounter is that after web site delivery there is a forced reliance on others (designers, programmers, etc.) to update or change web site content. Even small changes are often delayed because of lack of time or money. When this happens frustration mounts, initial project dreams (and investment) are lost and the web site becomes dead in the water. To counter this and empower the global health team for an extended life, we agreed to use an open source content management solution (Joomla!) as the engine for the seminars web site. Since the web site is now past the design and implementation stage, users can revise existing and add new content, including multimedia materials, with relative ease. Our intention was to build a scalable web site that could function as a foundation for interdisciplinary global health projects in years to come and serve as an online archive. The web site is modest but planned for growth. This project experience, as a whole, was an even more rewarding process of exchange, dialogue, and collaboration than I anticipated. My hope is that the results accurately and responsibly reflect the many interests, values, goals, and abilities of the multiple authors and inspires others. The direct outcome of this project was the knowledge transfer to our design for development projects in México. Shortly after ufglobalhealth.org launched in August 2008, we integrated aspects of this process and used the open source content management software to develop a web site for xyaat.com, a rural Maya community ecotourism cooperative. Democratizing communication technologies benefits everyone and is one more step toward dissolving territorial, economic, and social boundaries. To know that our client-partners own their projects and their communication, and to see the freedom, empowerment, and potential that are a result, are how we contribute to positive change in the world. For many years, UF faculty and students have worked independently on dental, medical and veterinary outreach activities in Latin America and the Caribbean. In recent years, faculty from colleges in the Health Science Center have been working on several education and outreach activities in Yucatán, México. More than once, during spring breaks, UF faculty and students would be on the same flights to Mérida and did not know we all were Gators and doing the same thing: making our contribution to global health education. One day, Dr. Andrés Aluja Schunemann (UADY’s Director for International Affairs) told me, Jorge, you know, many UF faculty come to work in Yucatán; but, it seems you don’t know each other, and you all have very similar interests. Since 2001, Dr. Traci Krueger (College of Public Health and Health Professions) and I had been working in Tunkás, a rural municipio in Yucatán. The population in Tunkás is ~2,500 people, ~600 families (75% of them have relatives in the United States). Unemployment is high. Teen immigration to Cancún and the US is a social and economic issue. Public health services are excellent given the limited resources they have. Public dental service was first offered in 2004. The first year, a young dentist arrived, and she was busy on day one; all school children have cavities, she said to me. Access to dental health in Tunkás had been overlooked for many years. Drs. Traci Krueger, Natalie Isaza, Sheilah Robertson and I came with students to Tunkás every spring break to assist Yucatán’s Ministry of Health with animal control and rabies vaccination efforts in dogs and cats. In Tunkás, more puppies are born than babies every year; more dogs are vaccinated against rabies than babies against polio. Tunkás, and other rural municipios in Yucatán, is an open text book of One Medicine for students in anthropology, dentistry, medicine, nursing, pharmacy, veterinary medicine and other disciplines. More recently, in January 2008, during a UF–UADY meeting in Gainesville, finally, UF faculty from the health and social sciences and the arts were all in the same room, with an opportunity to share our collaborative work in Yucatán. This meeting was very important to several people. This is the time when I first met Maria Rogal and became familiar with her development work in rural Yucatán. I connected with her work immediately. I could see the power of art and design and communication. I believe in health and economic development in rural communities in the developing world, and this combination cannot happen without a good communication system: simple, attractive, authentic, and based on local knowledge. Dr. Traci Krueger and I met few days after Maria Rogal’s presentation in January 2008, and we both agreed that Maria would be a great contribution to our vision of creating a group of UF faculty with interest to participate in a new dimension for international education: One Medicine, One Health. A first step was to offer global health education here, on campus. The seminars series in global health should be simple and relatively easy to accomplish, without the level of uncertainty that we often have to face when we are abroad. In addition, the seminars should be well structured, so that students and faculty can recognize the importance of this initiative. In June 2008, I contacted Maria asking for help. We wanted a poster to promote the seminar series in global health. I had been awarded a small grant from the UF International Center, and I thought these funds would be well spent on promotional materials. Three months later, Maria Rogal has created a very functional, original and elegant web site for the seminar series in global health. Course coordinators Enrique Bimstein (dentistry), Robert Lawrence (medicine), Judy Riffee (pharmacy), Traci Krueger (public health and health professions) and myself (veterinary medicine) are very proud of Maria’s work. It is very professional and very innovative. The logo is a very original piece of art and design that we value. It reflects respect, dialogue, synergy, ability of different disciplines to change and adapt to new challenges; always together. This is the power of art and design. Very simple, but powerful. Maria listened and delivered a very powerful tool we can now use to build more ambitious projects.